Screen grab of online Sept. 22, 2016, Elkhart Truth story about Keith Cooper. The Indianapolis Star and Chicago Tribune have followed the case of a former Elkhart man seeking exoneration in a 1996 armed robbery here, recounting the the twists and turns that led to his unjust conviction and, ultimately, his release in 2006. The trial and fight for his release all occurred before my time here at The Elkhart Truth and I’ve not done much crime stuff, in general, until the last year or so. 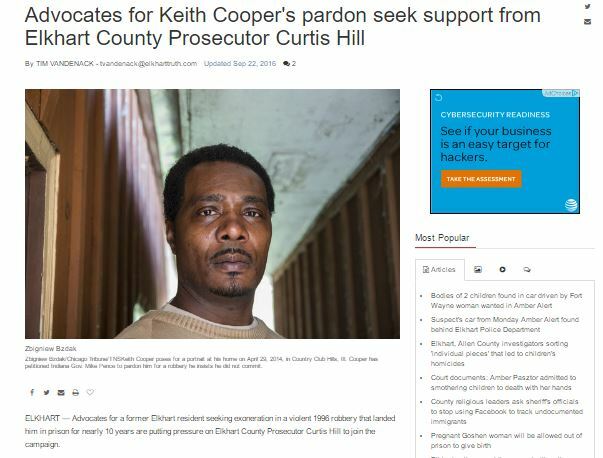 But when I learned of a new push by Cooper’s advocates to get him pardoned, I figured it was time that we, as the hometown newspaper where everything went down, look into the story. I didn’t repeat the digging done by the Indianapolis Star or Chicago Tribune — they’ve done some intense work — but I quickly got up to speed, reading their archives, talking to one of the advocates, looking into recent turns in the push.